Every road trip begins with a fistful of throttle and this one was no different. I roared out the gate and swept over the 100 metres of powdered dust that separates home from the bitumen. On to the by-pass road I swung a left, making a bee-line for the first break in the median strip. A quick U-turn and off I went, heading for the big roundabout opposite Triputri Homestay and Store. I negotiated the roundabout wrong-way-round, Indonesian-style, past the yet to be occupied ‘Art Market’ and turned right at the tee-intersection. I rode past Warung Jawa and the Magic Bar and past the smoked fish sellers, their fires giving off ribbons of grey-blue smoke in the early morning air. I slowed to walking pace at the main intersection opposite Lombok Discovery – all clear, I charged across heading west for Bangko-Bangko via the badlands of the south-west, whose hills were populated by a rag-tag army of gold fossickers from all points of the compass. I was looking forward to the trip. I swept past the Prabhu headland and wound my way through a succession of tiny hamlets, the road climbing at first gently, then steeply to a sharp left-hand hairpin that announced the beginning of the spectacular climb to the pass. Over my left shoulder a blindingly blue ocean rose and fell. Lines of waves rolled forward exhausting themselves on the reef in a timeless symphony of movement and spray. At the top of the pass the road levelled out before beginning its long descent to Are Goling. To the left I passed the caves where, according to legend, a giant once lived. To the right the hills and valleys marched to the horizon. The glorious sweep of the coast appeared along with the first major gold workings. Ramshackle huts held together with rope and vines and covered with blue plastic canopies dotted the hillside. I’m not sure that the million dollar view was much compensation for the men who toiled all day in the heat and dust urged on by gold fever and sustained only by a diet of rice and ... whatever. These hardy souls are risking all and some will pay a high price for the gold they glean from the stubborn hills. Using mercury and cyanide to process the auriferous slurry in a crude smelting process bereft of any safety equipment is risky business. Talk among the locals is of an increase in stillbirths and cattle getting sick but who knows the real story? There are no Health Department officials collecting statistics here. I left the miners to their game of roulette. Not long after I came across an accident. A young French couple on a scooter had hit the deck after striking a thin layer of sand atop a left-hander. Inexperience trumps enthusiasm every time. It might seem like fun to be trundling around back roads in a land far from your native Lyon but if you don’t know how to ride you often end up oozing blood and nursing a damaged ego – if you’re lucky. If you’re not, you might end up dead. I stopped to lend assistance. Pascal was bleeding quietly; he’d managed to wound three out of four limbs. Trembling a little he was still seated in the dirt. His girlfriend, Aimee, was a little better off with just a cut on her foot. The scooter was ok apart from the obligatory scratches. An English couple, John and Susan, had stopped too, and between us we hatched a rescue mission. We’d take the wounded back to town while Susan would wait for our return. We doubled up. I enjoyed a lively conversation with Aimee about French film and politics, my aim being to distract her from their current woe – it was their first day in Lombok. We reached their homestay in no time, left Pascal and Aimee in the capable hands of the owners, and bade them all farewell. We found Susan sitting patiently reading a book on Quantum Physics – as you do. She was so engrossed – such is the attraction of the Higg’s Bosun - she barely looked up when we rocked up. We gave her an update and I said my goodbyes knowing, although it was highly unlikely we’d ever meet again, we were united forever until this shared experience faded from one of our memories: the fleeting encounter that leaves a lasting impression. The sun was climbing the blue-sky backdrop as I rode west. Beyond the Mawi Beach turn off the road began its lovely sinuous climb up through what I called ‘The Green valley’ – a tear in the hills populated by monkeys, alang-alang and fresh air. Being dry season ‘Green Valley’ had a distinctly brown tinge to its flanks. At the top of the pass women worked away at the alang-alang cutting and assembling roofs for the next monsoon. The road then made a steep plunge through a guard of honour comprised of stately acacias before levelling out on the coastal plain. At Selong Blanack I turned north climbing steadily for a few k, the land to each side dry and thirsty, the rains still months away. At the top of a rise I came to a roundabout built around a magnificent old beringin tree. I asked the way and was pointed in the right direction. Twenty kilometres of gravel road slowed me. Caution rewards the cautious. At age 64 my years of ripping and tearing at the road in order to get somewhere faster than the next guy are long gone. I take pride in not having to put a foot down if I can help it. In addition I travel wearing shorts and my favourite travel shirt with its secret Velcro-sealed pockets beneath the armpits. I know that if I come off and hit the ground hard I’m going to lose lots of bark. So, I ride within my limits, keep my eyes skinned and ramp up the concentration on steep downhill sections. There was little traffic. A few trucks kicking up the dust were passed on the climbs. There were no cars or pick-ups, just the occasional motorbike heading into market or heading home. This was an area of no electricity but it was on its way. Concrete poles lined the road – lives were about to be changed. Just when I was getting a bit fed up with the gravel I struck bitumen. This road would take me south again to reach the coast at Pengatap. It rose and climbed and then reached a ridge which afforded glorious views of the coast. It was all downhill now. I roared into Pengatap and turned west again, the road hugging the coast. Brown cattle grazed not bothering to look up as I passed. In contrast, the gangs of schoolkids, in their brown and mustard uniforms, greeted me with a chorus of “Hello Misters”. The bitumen ended when the road turned its back on the coast and climbed into the low hills. It was lumpy, bumpy and dusty, kitted out with lots of loose rocks and sand traps for the unwary. Sepi Bay appeared over my left shoulder; a sheltered backwater, it sparkled and shimmered beneath the sun’s gaze, a solitary perahu making its way towards the beach at Pangsin. The waters below me were crystal clear and the reef looked to be in good shape – a likely snorkelling spot to return to one day. I breezed past Sepi and Kombang each little settlement supporting an impressive mosque; the devout were paying their dues on this stretch of coast. Around midday I pulled up at a warung in Slodong and ordered a black coffee. Siti, the owner, was a garrulous woman. She was surrounded by her kids and grandkids and was content with her little business and the company of neighbours and passers-by. She made a wicked black coffee so I had another prior to taking a few photographs of her with the grandkids and heading off for the most challenging part of the trip – the climb to the high ridge and the journey along it to the west. A distempered strip of bitumen took me to the end of town. Then the road became a track as it climbed and climbed and climbed. I was happy climbing. Gunning the engine, seeking the safest route, shifting between second and first and back to second, shifting weight from side-to-side or forward-to-rear was exhilarating. I met a couple of riders going the other way and gave them clear passage as they tip-toed downhill negotiating a wash-away. It felt fantastic to be in the back of beyond of nowhere. To the north lay rugged scrubby hills, their tops denuded and pocked with the aftermath of gold mining. Blue roofed canopies covering still active operations were plentiful. To the south lay the sea – Batu Jonggot Bay and Mekaki Bay. Hundreds of metres below me this azure mass rose and fell propelling its waters against the rocky coast to release a maelstrom of white water and spray. Grey-black headlands stared down the sea coldly indifferent to its efforts to obliterate them. "We've been here a billion years. Do your best but we're not in a hurry to go anywhere." I marveled at this stupendous coastline. It has never been mentioned in any guidebook, never made a list of ‘World’s Most Beautiful ...’ , and I had it all to myself. I felt privileged. I continued on stopping frequently to take photos. I came upon a rude dwelling and stopped to chat with the three folk shooting the breeze on the veranda. Dahlan, Misbik and Inak Idin had a million dollar view but had to scratch a living from the earth surviving on the corn, cassava and bananas they planted on their patch. Life was not easy in their world but it had its compensations – peace, quiet, no nosy neighbours to gossip about you, the cool breeze blew every day and the view was like a drug you couldn’t tear yourself away from. I asked them about life in the hills. Had they ever been tempted to try their luck with the pick and cangkul? No, it was dangerous work and the risks were many. There was nothing out there except hard work and hope. No guarantees of anything. No police, no medical, no nothing – ‘Just the ‘law of the jungle and lots of holes to get rid of the bodies’. I took a few photos and promised to drop by again which i will for sure. Dahlan surprised me with the news that the bitumen began again at Rambutpetung and it was only a few kilometres away. I waved goodbye and headed out of their compound. Sure enough fifteen minutes later I reached the promised road, a newly-laid blacktop. This was a bit of an anti-climax as I wasn’t expecting to strike good road for at least another twenty kilometres. I sped north and soon struck the coast near Kayuputih. From there to Bangko-Bangko was a doddle. The road clung to the side of the bay, fishing boats bobbed, waves lapped gently, cattle grazed and villagers lolled about lazy-afternoon style. Labuhan Poh came and went, Bangko-Bangko arrived. I travelled the last few kilometres of unmade road and ended up in a fishing village. 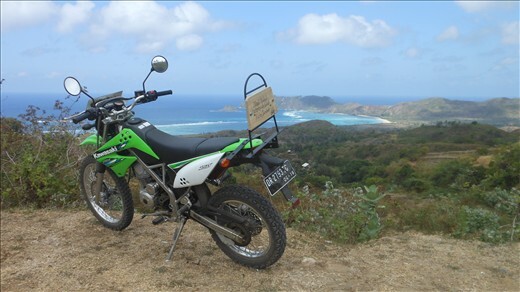 After a brief chat with Putu, a visiting Balinese, I headed off again along the sandy track that skirted the shore. The sea was pancake flat – not a wave or board to be seen. So this was Bangko-Bangko. I’d made it by the back roads – just as I’d set out to do. I was satisfied. The trip had rewarded me with some spectacular views and some memorable encounters. I’d met some lovely people on the way, managed to keep all bark intact by remaining upright, and now I had the pleasure of returning home by an alternate route. I made it back to Kuta just after 5 pm. I’d been away all day and although tired and dusty the blood was still coursing through my veins. I was alive and full of the love of life. Give me an open road, a blue sky and a motorbike – the rest will take care of itself.